The owners of Get Floored-Floor Coverings have been providing in-home design consultations and floor covering installations since 1968 and have first-hand knowledge of the products, techniques, and all facets of great quality design work and product needs. Whether you are looking for “One Floor or More,” Get Floored will provide you with the honest and reliable quality you expect for the next investment in your home’s value; Call Us Today at (435) 773-2667. When you buy carpet from Get Floored of Southern Utah, you can be assured that you’re getting a top quality carpet from a major carpet mill with the professional knowledge and installation that can be expected after 36 years of experience. Get Floored offers you a comprehensive selection of styles and colors, with the most up to date designs and fashions at the price that’s right for your budget and lifestyle. You will also find the best customer service, professional installation, and full product/labor warranties to protect your floor covering investment. For more information, or to Contact Us for a FREE In-Home Design Appointment call (435) 773-2667. If you seek the natural beauty of hardwood flooring or stone but want quick and simple maintenance, laminate flooring is the way to go. Maintaining and cleaning laminate floors is easier than most hardwood or natural stone. Get Floored of St. George installs laminate flooring that is thick, durable and backed by up to a 50-year warranty. View our Portfolio to see how our laminate flooring can transform your room. Laminate floors are very easy to maintain, durable and extremely scratch, sunlight fade and stain resistant. Don’t forget – Get Floored is owned and operated by lifelong floor covering specialists who are always available by phone at (435) 773-2667 to provide expert advice and laminate flooring installation. Hardwood flooring is an environmentally-friendly flooring option for your home, but could be one of the more demanding to install and maintain. Whether you prefer easy-to-install, engineered hardwood flooring or the beauty of cherry or oak wood floors, you’ll find a wide assortment of options available from Get Floored. Our selection includes a variety of hardwood flooring including bamboo floors, oak flooring, walnut flooring, maple flooring, white oak flooring, cork floors, Brazilian cherry flooring and hickory flooring. Call Us Today at (435) 773-2667 for a FREE Design Consultation ($150 Value) at our showroom or even at your home to see what options fit your lifestyle, budget, and design. Prefer the natural side? Call Us Today at (435) 773-2667 to see our stunning and luxurious floor tiles from Get Floored. From ceramic and porcelain to natural stone, our tiles create floors that attract attention with their look and transform your house into the home you’ve dreamed of. The quality of our tile options means that they’ll enhance the surrounding design, no matter what that design may be. Tile is a timeless investment in your home, and we have designs and styles to fit any budget. With easy-to-maintain finishes and unmatched durability, you can be sure that your floor will keep attracting attention for years to come. In addition, the cost of maintenance and hazards of dust, pollen, and allergens are kept to a minimum when tile is chosen. Your professional Southern Utah Tile Consultation ($150 Value) is waiting at Get Floored of St. George (435) 773-2667. Looking for the Adults only section? Travertine is the selection when you seek luxury appeal with lasting finish. Travertine will add value to your home and provide the “Awe” effect for visitors and family. However, please consult with your professional installers at Get Floored (435) 773-2667 before choosing Travertine for your home. Without proper sealing, maintenance, and care your travertine floors can go from luxury to misery over time. Travertine may have been the stone of the Romans, but in today’s world of children, dogs, or even spilled drinks, travertine may not be worth the maintenance involved. Let Get Floored professionals advise you during a FREE Flooring Consultation; Call Today (435) 773-2667. Looking for that decorative touch that will impress all of your guests? Think about using stained glass as an accent wall, backsplash, or even to encompass a chimney! Glass tiles offer a unique appearance unachievable with conventional tiles. The vibrancy and depth of color combined with the reflective quality of glass results in a unique and dramatic effect. Glass tiles are ideal for showers, sunlight, or heat as they are easy to clean, maintain, and they never discolor, making them perfect for a tile backsplash or other high-use areas. They will continue to keep their dazzling appearance for many years to come. Why not create a stunning mosaic bathroom wall, a great way to give your bathroom a new look without having install a new floor tile. To Schedule a FREE Tile Consultation with a Glass Tile Specialist Call Us Today (435) 773-2667. Tile is not only a type of floor covering, but it can be used to enhance and preserve any surface. The specialists at GetFloored can take any tile of your choosing and make a fantastic backsplash, countertop, or accent wall for your home. The benefits of tile durability and ease of clean are why homeowners choose tile as both a floor covering and as an enhanced backsplash or countertop material. With varying sizes, shapes, colors, and qualities our specialists at GetFloored can help you determine the right product for your idea. Contact Us Today for a FREE Design Consultation at (435) 773-2667. Granite tile brings luxury and splendor, while at the same time offers easy maintenance and resistance to most damage. Granite tile is a versatile, durable material that can greatly enhance the look and feel of any room. Available in a seemingly limitless range of colors and textures, granite is most often used for granite countertops in the kitchen, but there are many other levels of sophistication that can be acquired using granite tile for accents or floors. Use granite tile for a wall covering for a stunning display, adding a touch of bold elegance to any room design. You can complement a granite countertop with a granite backsplash or wall covering, or add charm and elegance to a hallway or other room with a granite tile floor. Contact Us today (435) 773-2667 for a FREE In-Home Consultation to discuss your options. Use Travertine for specialty applications when you seek luxury appeal with lasting finish. Travertine will add value to your home and provide the “Awe” effect for visitors and family, even if it is only in small portions for decorative uses rather than as a mainstay flooring use. However, please consult with your professional installers at Get Floored (435) 773-2667 before choosing Travertine for your home. Bathrooms are one of the primary focuses of today’s building and remodeling projects and we at GetFloored know just how to incorporate a tiled shower, with their aesthetic and hygienic benefits, with your new or existing floors. Tiled showers are luxurious and beautiful. A plethora of tile colors, designs, and shapes provides endless possibilities and enhances the aesthetics of the entire bathroom. Tiled showers also allow for flexibility when installing the latest features, such as benches, niches, windows, multiple shower heads, and steam units. One thing to remember when choosing your tile shower installation company is whether they have experience and knowledge to install your shower. Contrary to popular belief, tile and grout joints (even sealed grout joints) are not waterproof. Moisture that penetrates these areas and collects in the wall cavities or floor structure is the primary cause of mold and leaks. In order to create a tiled shower that will last a lifetime, a waterproofing system is needed beneath the tile covering and we at GetFloored have the knowledge and experience needed to ensure proper installation and waterproofing protection. 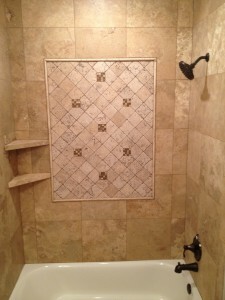 Contact GetFloored Today (435) 773-2667 to have a FREE Quote on Tile Shower Installation. Natural stone in the shower is largely about appearance: it looks great in your shower or shower/tub, or as a tub surround. This level of elegance and warmth is unmatched with standard tubs or plastic /vinyl shower liners. If you seek to have a long lasting, “spa-like atmosphere” type of bathroom or shower natural stone is a must have. However, with natural stone there is more maintenance than common acrylic or ceramic tiles. Natural stone is more likely to allow water permeability and needs more frequent cleaning and sealing in order to keep its appearance. If you have questions, or would like even more information on the potential for a natural stone bathroom or shower please Contact Us (435) 773-2667 for a FREE In-Home or Showroom Consultation.